Hello my dearies! How's life? I am at my last trimester now. Time flies eh? Can't imagine that I will be delivering in another 3 months! Things are pretty much the same, but I do get tired easily now. Hence the hiatus on blog updates. 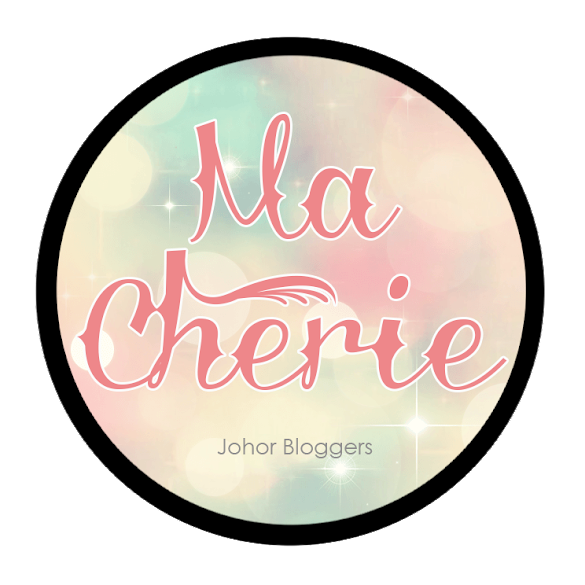 This post took me weeks to finish so do support by reading, okay? 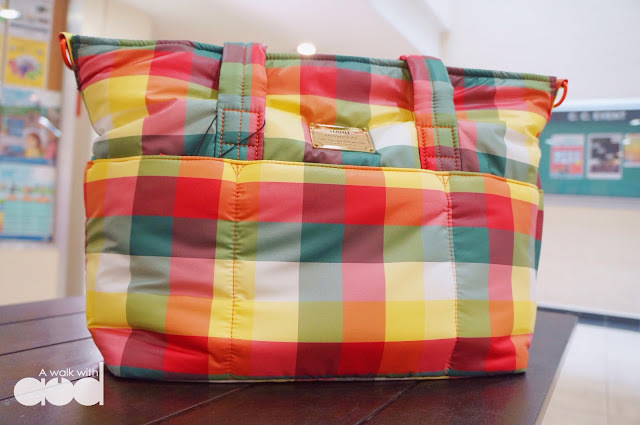 Today, I'm gonna talk about a bag that I recently found and have really grow fond of it. 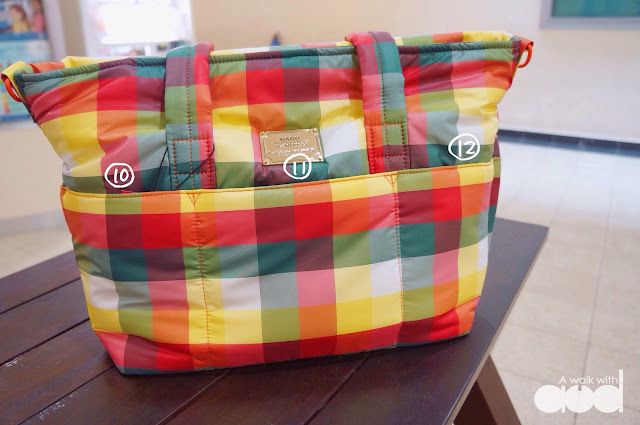 When I was in the midst of getting all the baby stuffs for my girl, I thought that maybe I should also get a diaper bag aka mummy bag for myself. Confession: Before I was a mum myself, I thought that mummy bag is pure gimmick and not necessary as any bag can do the job. So why the need? But now I am a mum myself, the thought of getting a mummy bag grew stronger so I did quite a bit of research to see if there's a need for one. After reading up, I think I finally understand why it is popular among the mummies. 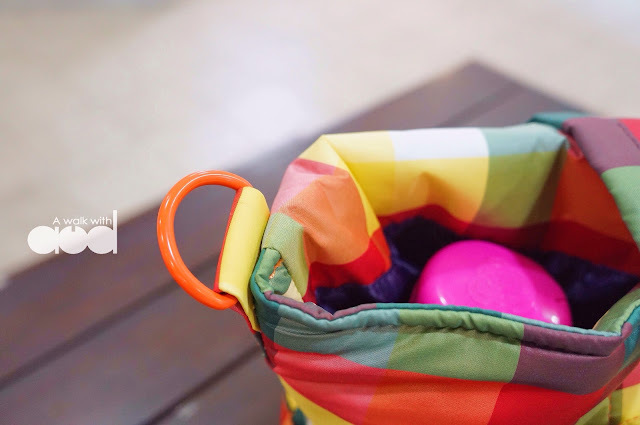 Mummy bag is specially designed to accommodate to mummies' needs, so what's a mum needs of a bag? Apparently, lots of compartments and extra lightweight. Going out with a baby can be quite daunting. Things like a couple of diapers, handkerchiefs, extra clothes and mittens, thermo flask, milk bottle, milk, pacifier, and small blanket will need to be brought along to attend to baby's needs. Not forgetting mummy's own belongings like wallet, phone, camera and more. 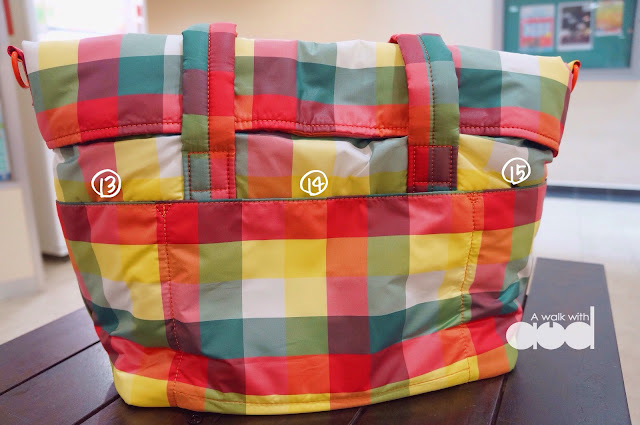 A normal bag with limited storage compartments can be a mess loaded with all the things above but a mummy bag will do the job just right by providing more than 10 compartments for mums to organize. Besides that, imagine the weight of the bag that you will be carrying around along with a baby. I bet my shoulder will break, so extra lightweight is necessary. 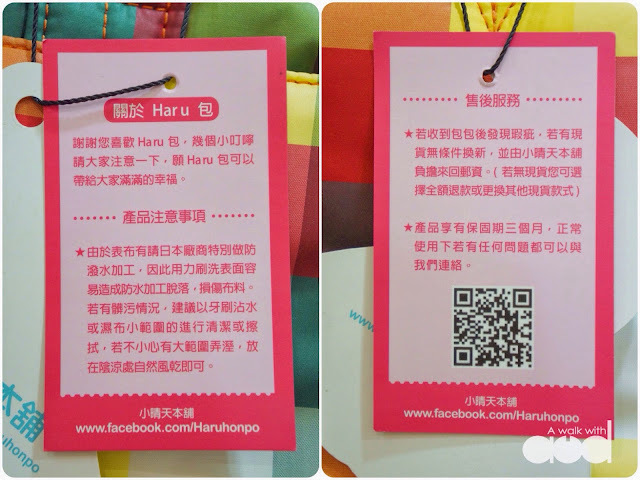 After much research, I found Haruhonpo | 小晴天本舖- A Taiwan brand that specialize in diaper bags aka Haru Air Bag. 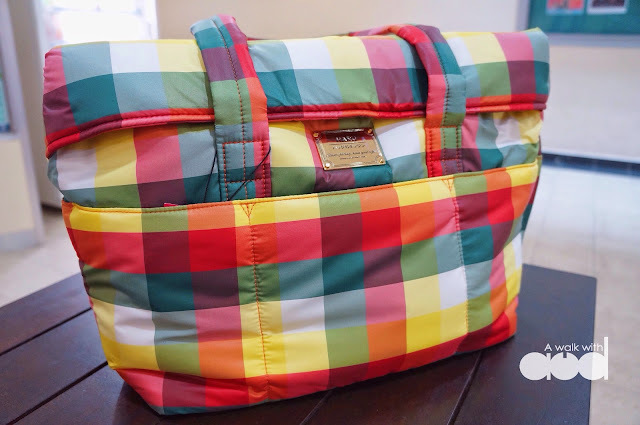 Unlike other western diaper bag brand, Haru Air Bag is colorful, vibrant and soft in texture. It feels kinda fluffy (like there's air inside) hence the name Air Bag 空气包. 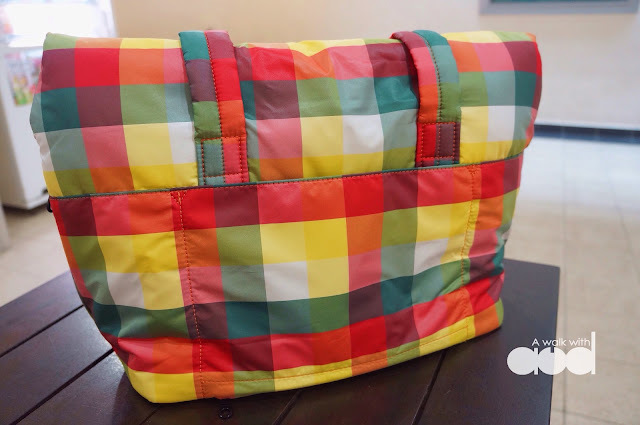 The colorful and versatile design makes the bag suitable for any ladies too! You can read more about the brand story >>here<<. 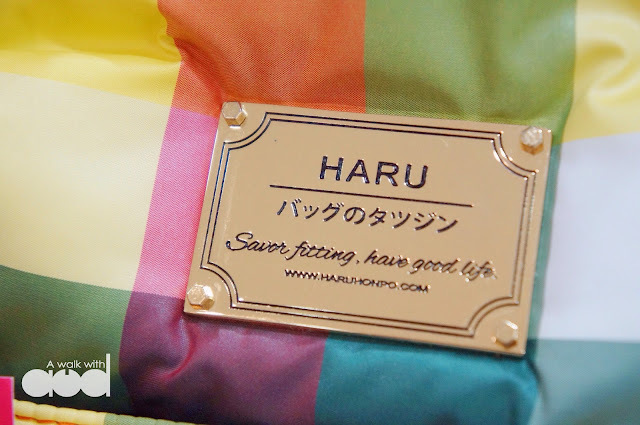 Currently, Haruhonpo has 7 different designs of Haru Air Bag. Six for the adults and one for the kids. I had my eyes on their Deluxe Travel bag and Backpack Traveler (will feature in another post). 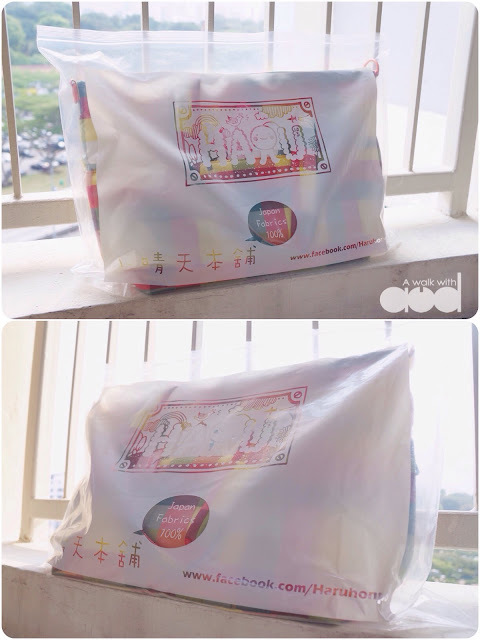 Each bag comes with a zipper bag instead of dust bag. 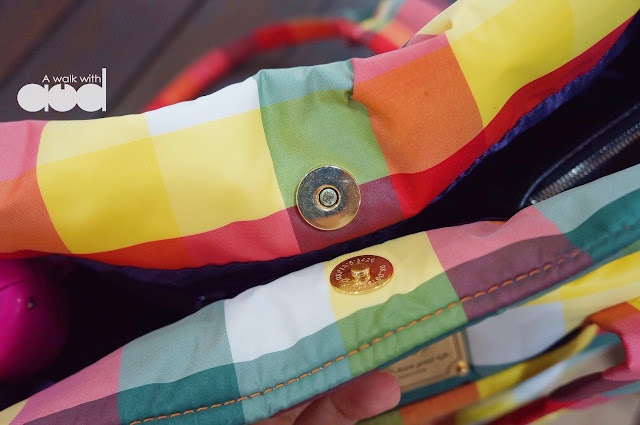 The owner of Haruhonpo believes that a zipper bag will be more of use compared to the typical dust bag. Also, every bag has a cute Teruterubōzu tag. 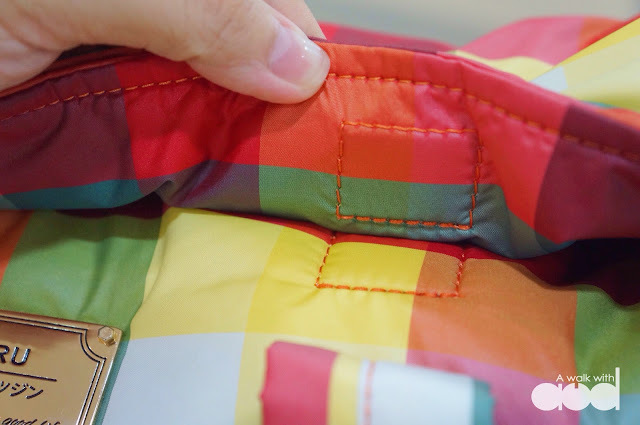 All Haru Air Bags are made of Japan fabric and post processed with water resistance layer. No more water spill worries. 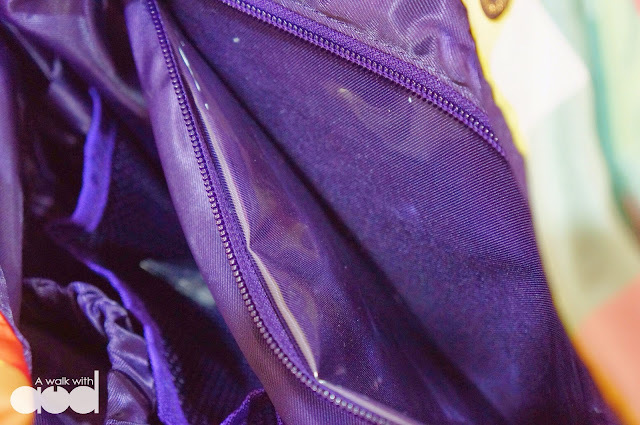 Also, due to the post process, the color of the bag will not fade over time but it is advised not to rub or scrub the surface of the bag too hard as it might damage the fabric. 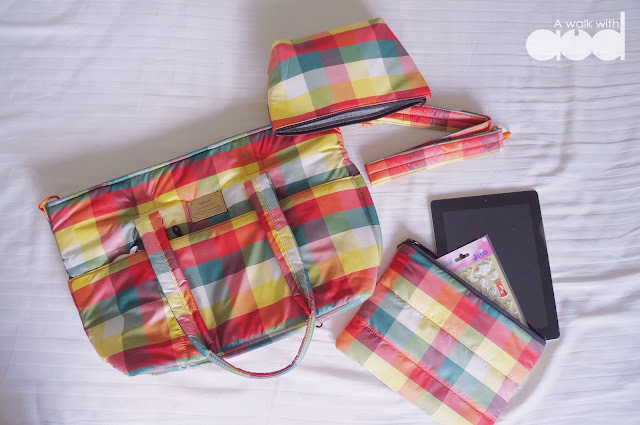 Haru Air Bag - Deluxe Travel comes with a same design sling strap, a double zipped pouch, and a cooler bag. It has a total of 15 compartments in default (I will show you how I make it into 16 compartments below). 9 compartments in the inside. 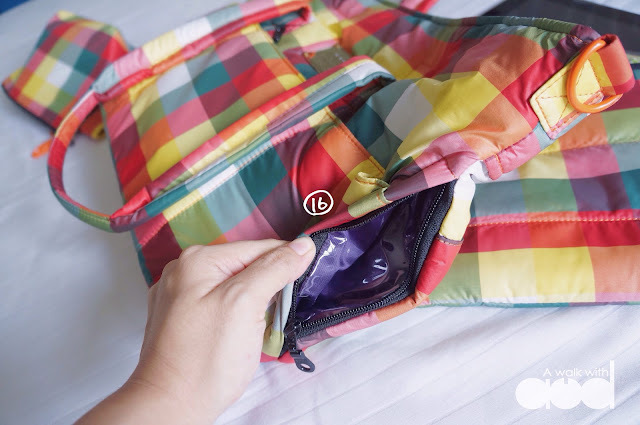 One of the inner zip compartment comes with water resistance surface for mums to store wet clothes. On the front, there's 3 compartments. 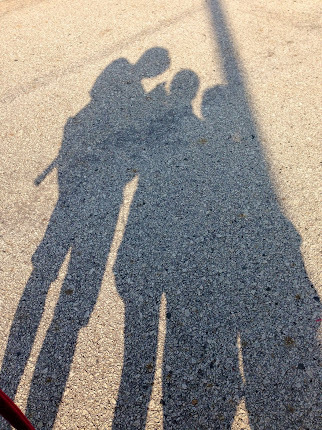 The one in the middle is a zipped pocket. At the back, there's another 3. It's actually 2 compartments (13 and 15). 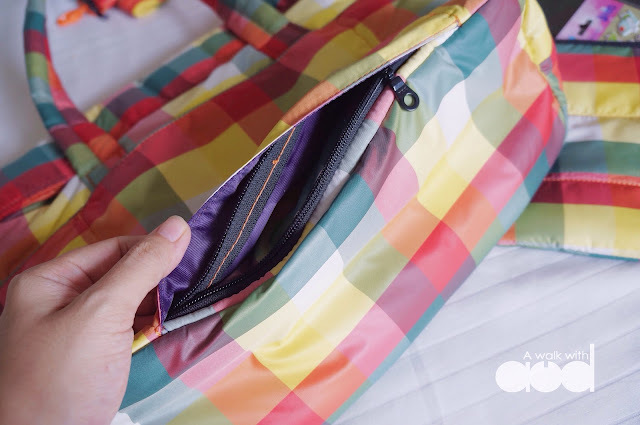 The one in the middle (14) has a zip at the bottom, it was designed to be unzipped so you can slip the Haru bag through your luggage bag handle when you are out for travel. But as for daily use, I normally zipped it and use it as an extra pocket to keep my phones. 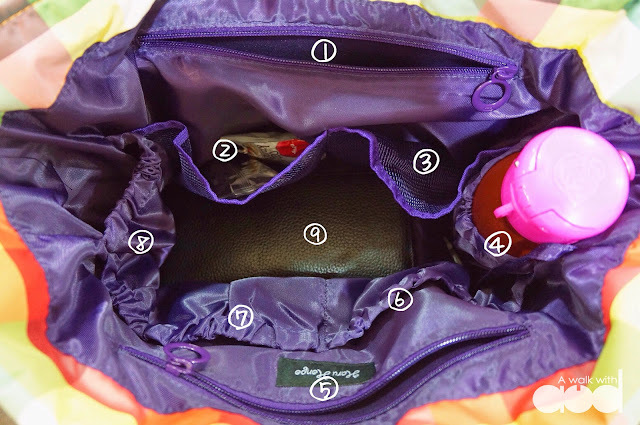 The last compartment lies at the side of the bag, it is also water resistant so that mummies can keep wet stuff here. I love the fact that Haru Bag has every details taken care of. The gold plated badge and magnetic snap button add a classic touch to the bag. Sling strap hook in matching color. 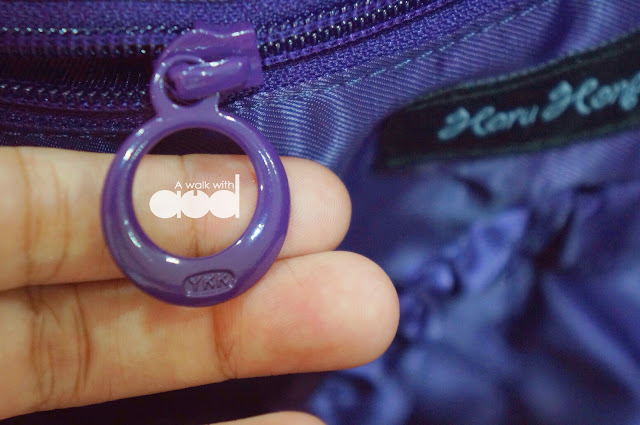 All Haruhonpo bag uses zippers from YKK, the well-known zipper company in Taiwan. Instead of normal zip, they used a round shape zipper, it's cute isn't it? 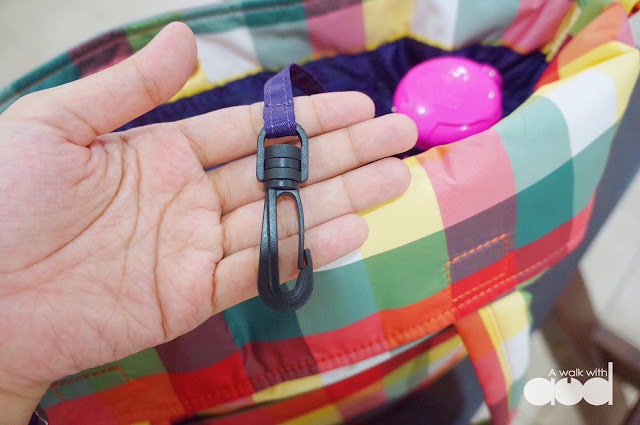 Being able to store so many things in the bag, it may be frustrating to be not able to find your keys right? Fret not, the bag has a key ring to hold your keys for you! Mummies can even hook pacifier on it so you know exactly where to look for it when your baby cries. 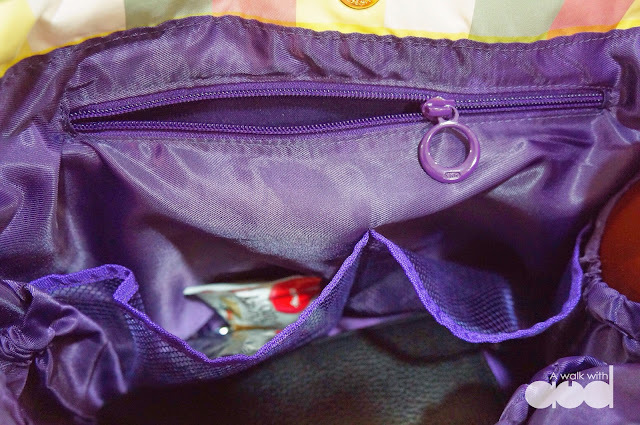 I understand that many of you might be concerned about the safety of a magnetic snap button bag. It seems a bit too easy to access right? 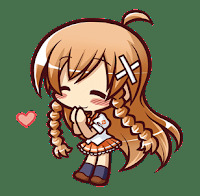 No worries, Haruhonpo got your back. 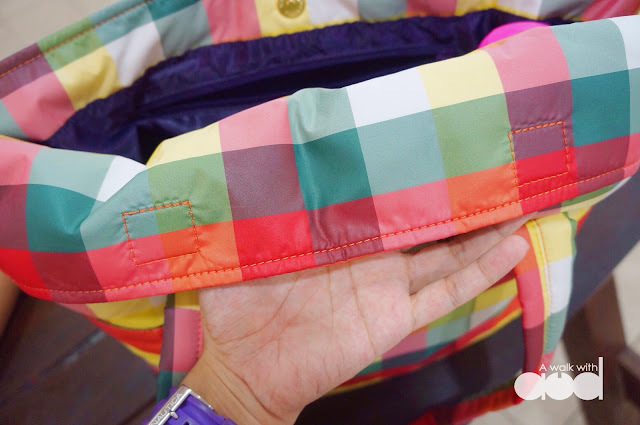 One of the sweetest feature of this bag is the flip over cover. Notice the 2 little squares? They are actually magnets. 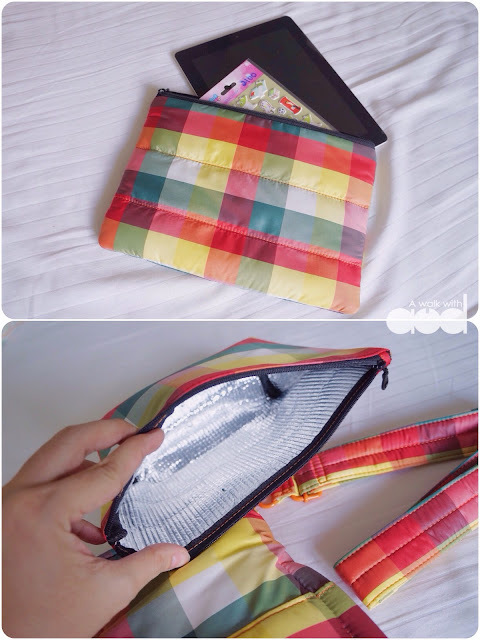 Flip the cover to the front, the magnet will be secured and tadah, your bag is covered! Your belongings are now safe from pickpockets, rain and even from your own child digging the stuffs inside. Not sure how it works? Here's a GIF to show you how. This is how the bag looks after flipping the cover to the front. 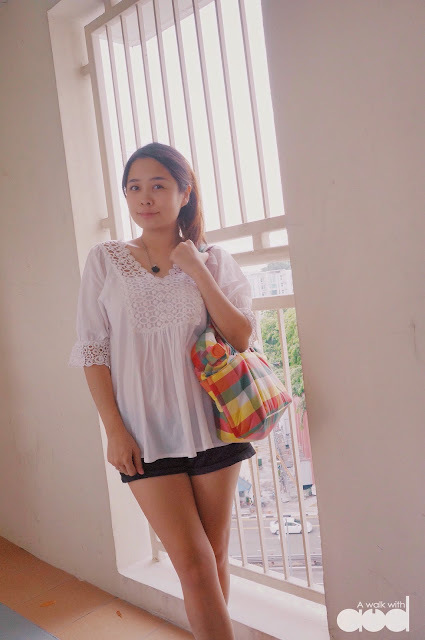 Here's some of my OOTD look with Haruhonpo Deluxe Travel Bag. Pardon for the weird angle as it's my first try taking OOTD photos without any help. It's not easy you know especially when I don't have a tripod and remote shutter for my camera, ha! GOOD NEWS! Mummies and ladies in Singapore, Haruhonpo will have their FIRST pop up store at TAKASHIMAYA (Kids level) from 4th June to 17th June 2015. Do drop by to try this wonderful bag for yourself. Don't missed this awesome chance! 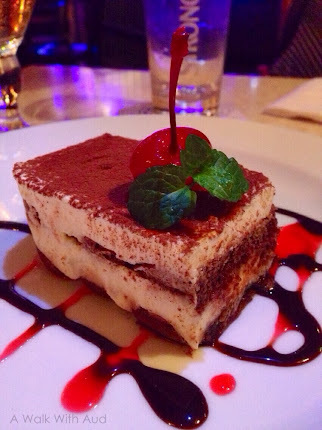 I am sure you will like it as much as I do. Haruhonpo, it's a bag full of Happiness! 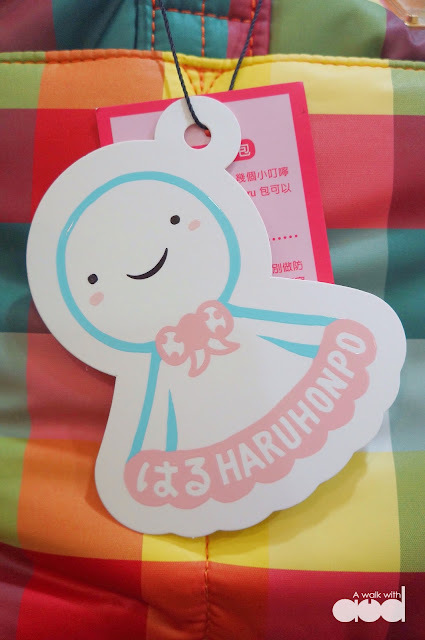 To find out more about Haruhonpo | 小晴天本铺, visit their facebook and website. 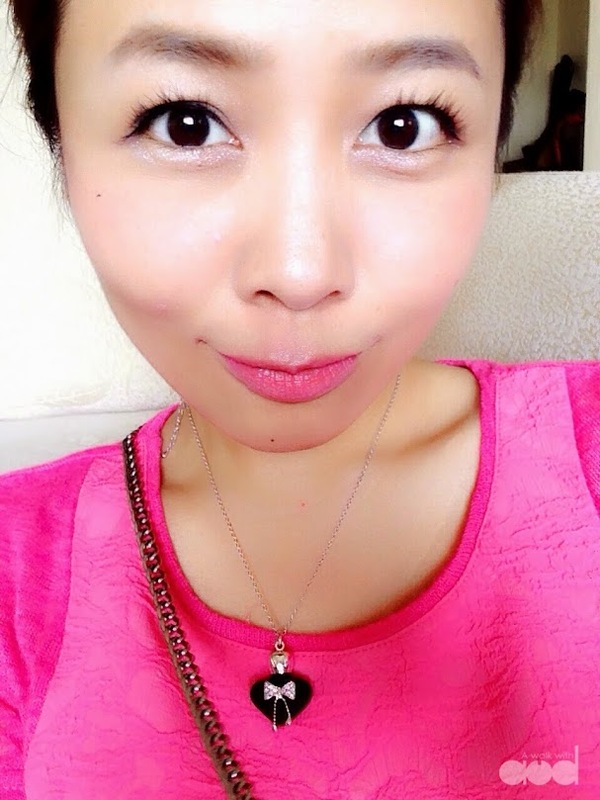 You look great here dear! 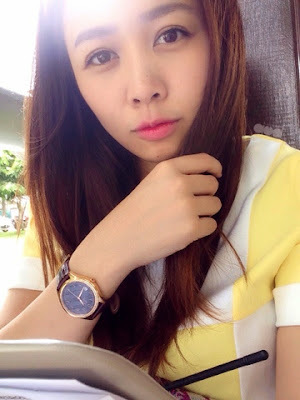 Thanks dear!! I really love it! its like my everyday bag now. I got another one. Will post about it soon!